More than ever, Jazz from Europe is an international phenomenon. The originality and authenticity of European Jazz is by now even acknowledged in the American motherland, not least since the Esbjörn Svensson Trio (e.s.t.) from Sweden was the first European act to grace the cover of Downbeat magazine in 2005. But there are other new stars from the old continent like Jamie Cullum, Nils-Petter Molvaer, Silje Nergaard, or Tomasz Stanko who are known and revered all over the world. 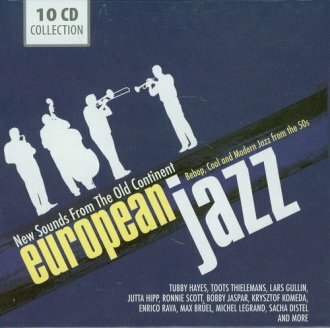 This box-set shows that these artists are not only the tip of the iceberg but also, like they say, standing on the shoulders of giants : the ten-CD wallet-set European Jazz presents the impressive beginnings of a unique Modern Jazz from the continent. Already in the 1950s Jazz-musicians from across Europe reached not only instrumental mastery, but also found original sounds and styles between Bebop and Hardbop, Cool Jazz and national (Folk-)traditions. Innovators from Scandinavia (e.g. Lars Gullin, Ake Persson), Italy (ECM-Star Enrico Rava, for instance), Poland (the legendary Krzystof Komeda, who also wrote many a soundtrack to Roman Polanski s movies), Belgium and the Netherlands (Harmonica- virtuoso Toots Thielemans or Bobby Jaspar), France (Michel Legrand, Sacha Distel, and many more), Great Britain (sax-players Ronnie cott, Wilton Gaynair, or Tubby Hayes) or Germany (Jutta Hipp, Michael Naura et al) created a Jazz-music that was as groundbreaking back then as it is fascinating today. The more than 150 recordings on this box-set many of which are presented for the first time on CD and most of which are only available in this collection today present some of the most important and most exciting recordings from the creative beginnings of European Jazz. A thrilling experience between improvisation and composition (not only for European Jazz-fans), a great sounding Continental trip through the coolest sounds of the Fifties, and a treasure trove for collectors.